Nice double header dolphin catch on our sportfishing charter. Our fishing charters are catching a variety this week. All sorts of different fish are biting. 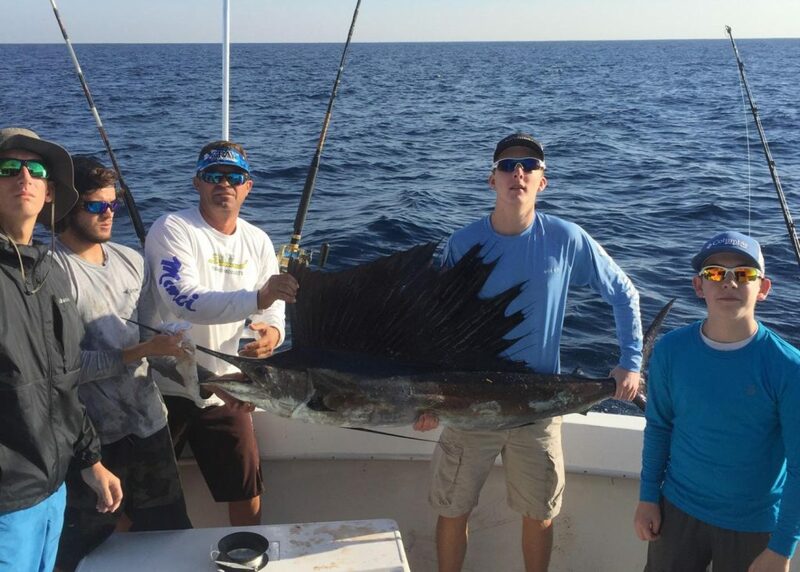 First off, sailfish are king this time of year. They are our cool, most exciting and most sought after fish to catch in south Florida. Sailfish are so spectacular because they are big, elusive and they put on the most awesome display of jumping during the fight. When a sailfish is hooked, they jump, somersault, flip, twirl, twist, turn, shake and dance on the top of the water. They put on a show that rivals the Olympic Gymnastics competition. No other fish (except maybe tarpon which come damn close), will fight the angler like a sailfish will. Add to that that they are big and beautiful and you have the ultimate gamefish. December is sailfish season in Fort Lauderdale with some of our best sailfish action of the whole year. There is an area, just a mile offshore Fort Lauderdale, the path of water from 120-180 feet deep that runs parallel to the coast which we call “Sailfish Alley”. It’s just outside the reefs and on the inside edge of the Gulfstream and it’s where a good 85% of all our sailfish are caught. What is so surprising is that it’s only a mile offshore. That is mind-boggling to anglers from different parts of the world in that we can catch such large and awesome gamefish so close to shore. We have a funny saying that Ft Lauderdale is the only place in the world where you can snap a picture of a sailfish with a condominium in the background. We catch them literally in our backyard. That’s what makes Ft Lauderdale the sailfish capital of the world. Angler catching a big sailfish on our sportfishing charter. Well, sailfish are the grand prize but we don’t catch them on every single trip. You have to get lucky. But this is the best time of year to go after them. Some days we even catch multiple sails. But on the days when the sailfish bite slows down, we still have plenty of other cool gamefish to catch. Mahi-mahi are making a run down our coast this month. They bite really good whenever we get a strong east wind (basically whenever the weatherman tells you not to go fishing because the waves are high). Well, the choppy water is prime conditions for mahi-mahi and they are my favorite days to fish. 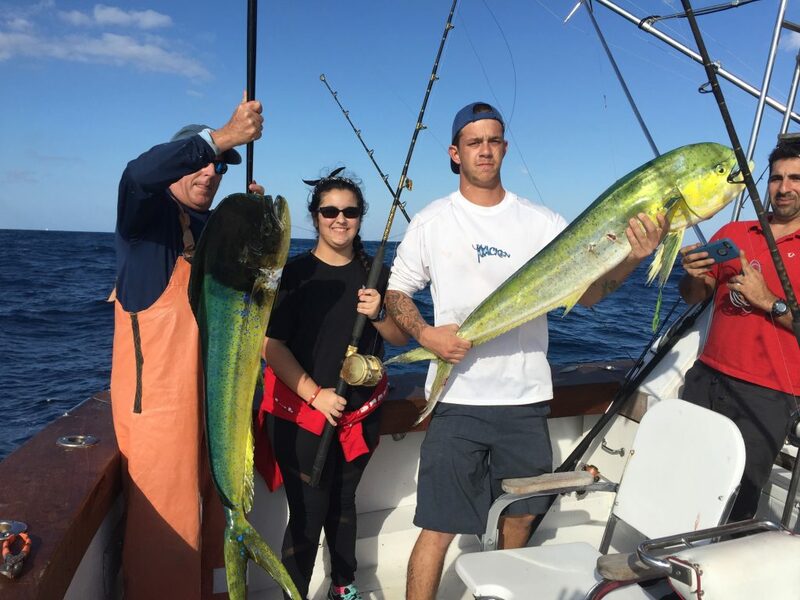 December is famous for strong winds, choppy seas and good catches of mahi-mahi. We’re catching the mahi-mahi (dolphin fish) in 200-400ft of water either by trolling or live baiting. Dolphin average 4-8 pounds but can get up to 50 pounds. They are also good fighters that jump out of the water when hooked and unlike sailfish, they are excellent eating. If you get some dolphin on your trip, take some filets over to our local restaurants … Quarterdeck, Coconuts or a dozen other restaurants that will cook your freshly caught fish. It’s always fun to eat the fish you just caught. Wahoo are biting! When you catch a wahoo, you scream WAHOOOO! It’s the law. 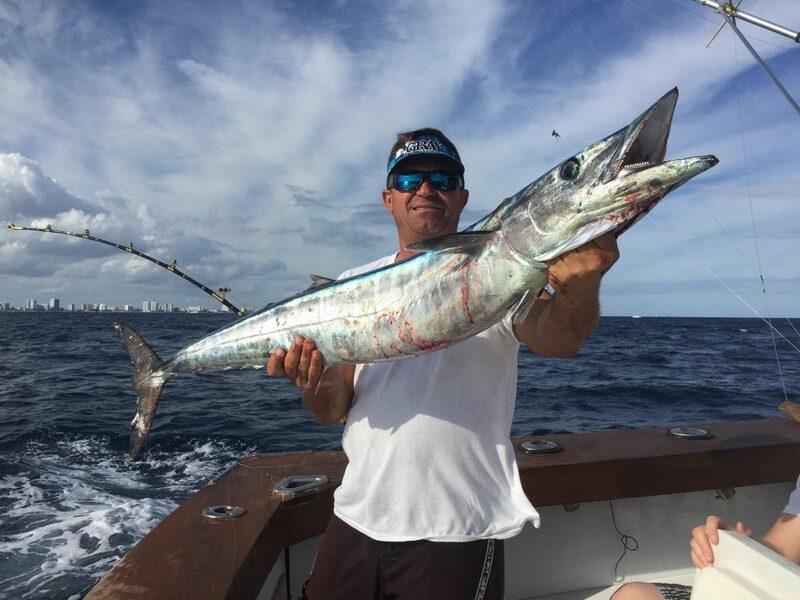 We catch wahoo by trolling, which is a form of fishing where the boat is moving and we drag lures behind the boat. This is a good technique because it allows you to cover a lot of territory out there. Wahoo love a moving bait, in fact, the faster the bait is moving, the better. For wahoo, we troll at speeds from 5-20 mph. It’s pretty radical to get a bite when you’re trolling at 20 mph. Line screams off the reel so fast, the reel actually smokes. Wahoo are debated to be the fastest fish in the ocean so no speed is too fast for wahoo. This week, we’ve caught some big wahoos ranging from 20-45 pounds. December is generally a good month for wahoos. And when trolling, you can catch all kinds of other fish too such as kingfish, barracuda, bonito and tuna. All those fish are larger, predator fish and they patrol the same waters that wahoo do. Wreck fishing can be good if the bite is slow. Let’s face it, fishing is fishing. Some days the fish are practically jumping in the boat and some days it seems like the ocean is empty. There are so many variables with fishing, you can’t predict when they are going to be biting. The only thing you can do is go out there and wet a line. Well, on the slow days when trolling and live baiting just isn’t producing anything, try some bottom fishing. 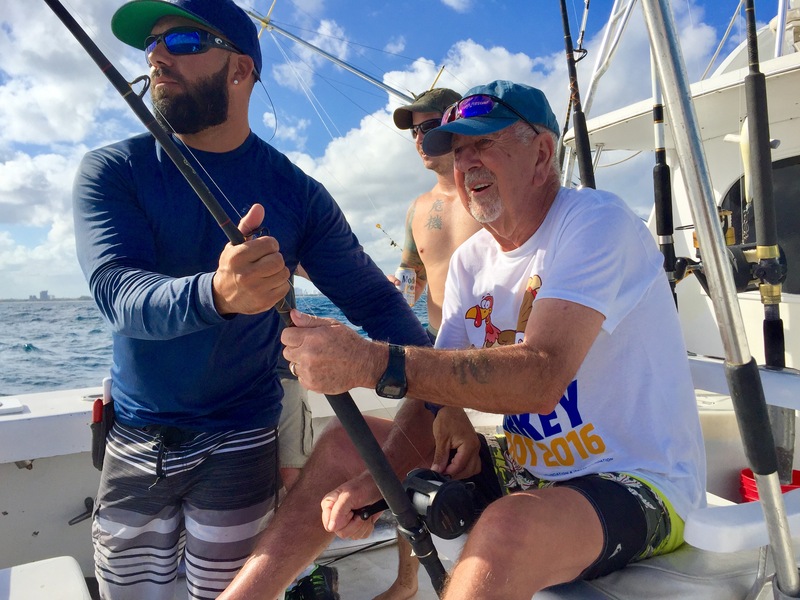 We do bottom fishing anywhere from 30ft of water for yellowtails and mangrove snappers, out to depths of 500-600 feet for golden tilefish and snowy grouper. There’s a lot of variety of fish on the bottom and some of them get really big. 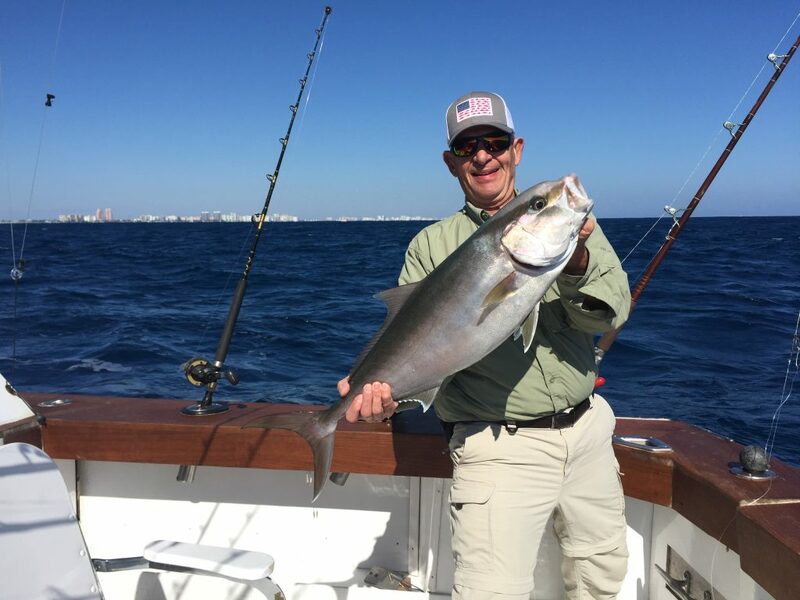 Amberjacks are probably the strongest fish in the ocean pound for pound and they just start showing up around our shipwrecks this time of year. The Spring months are when they are here in big numbers but there are some here now. Groupers, cobia, snappers, barracuda and sharks are all top of the food chain fish that hang around shipwrecks and other underwater structures to do their hunting. With the strong action on the topwater, pelagic fish this time of year, we don’t do too much shipwreck fishing. But it certainly is a great way to catch some fish when the topwater bite gets slow. 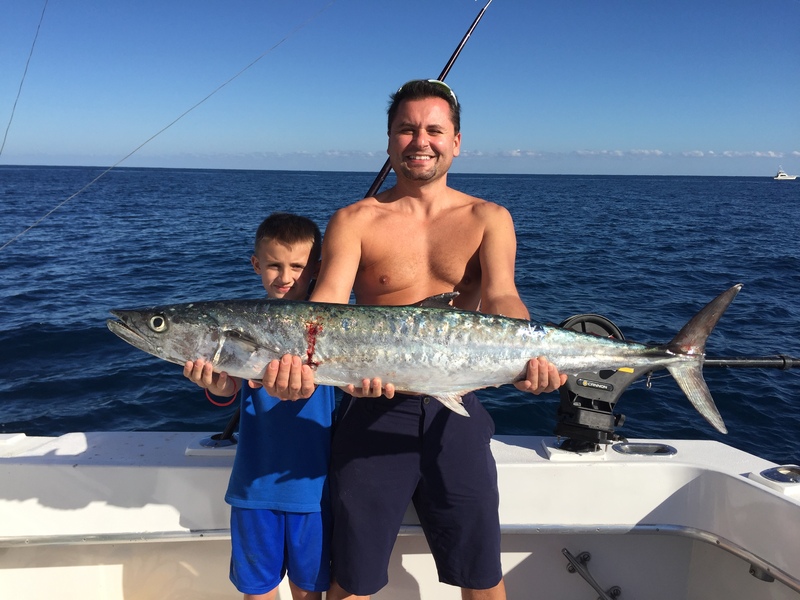 Nice kingfish caught by this father and son fishing team on our sportfish charter. There’s a lot of variety around this month and plenty of big fish to be caught. Don’t be afraid if the ocean is rough like it can be sometimes this month. Take some Dramamine and brave the seas. Some of our best fishing days are when the ocean is sloppy. Good luck to everyone fishing this month. I’ll sea ya on the water! 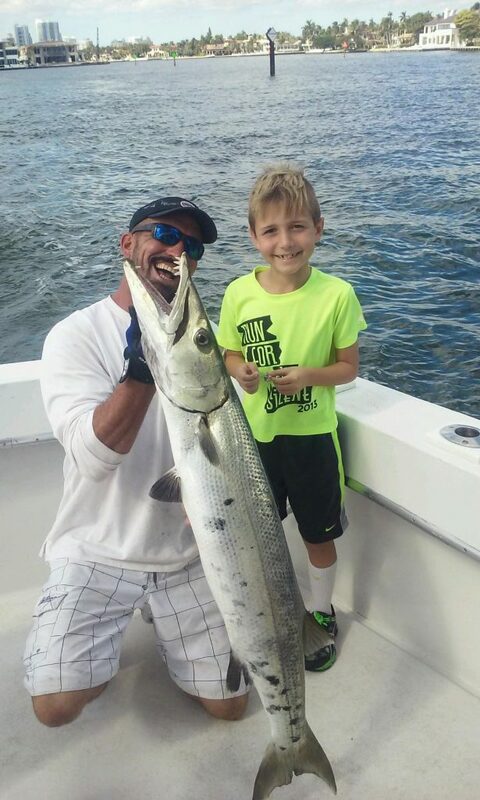 Nice barracuda caught by this young angler on our fishing charter. Nice sailfish just caught on our fishing charter out of south Florida. 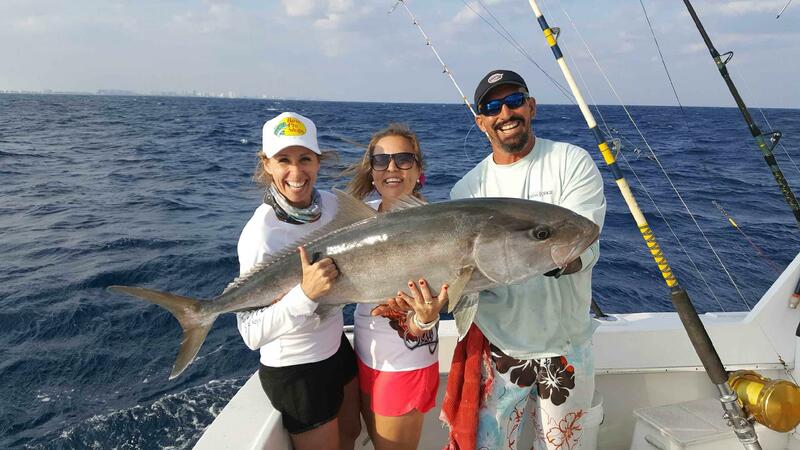 There are some awesome fish biting on our fishing charters this week. I don’t know if it’s the time of year, the supermoon we just had or if there’s something in the water, but there are some unusual catches coming in this week. First off, the sailfish bite has been pretty good. This is the season when the sailfish start biting in good numbers and we haven’t even had any cold weather yet. Well, this is usually the time when the weather starts to cool down so good sailfishing is about to become awesome sailfishing. Wahoo are tearing it up out there. With the supermoon and the big tide swings, the wahoo are biting like mad. 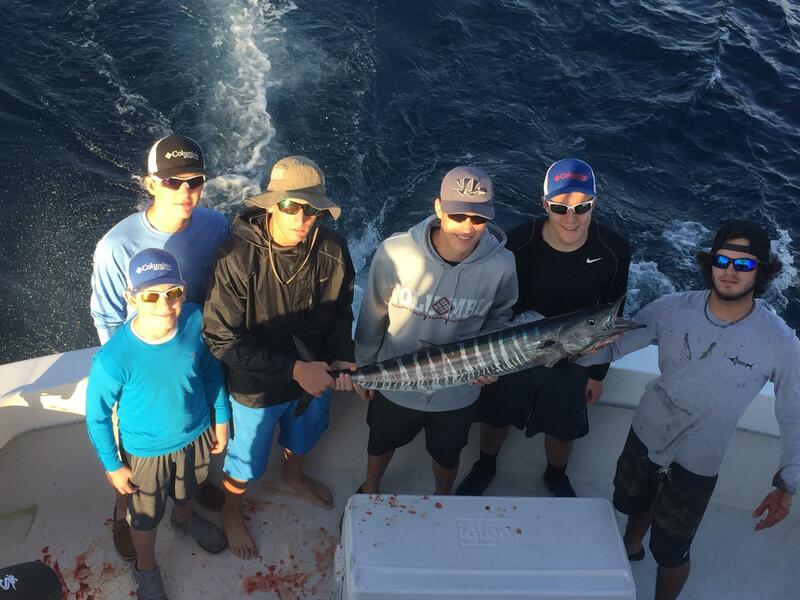 A few really nice wahoo and a bunch of medium sized ones were caught this week. Usual catches of kingfish, mackerel and bonitos are also hitting the docks. We’ve caught some unusual fish this week. The snapper pictured above is a humongous dog snapper. I thought it was a cubera when I first saw it, it was so big. 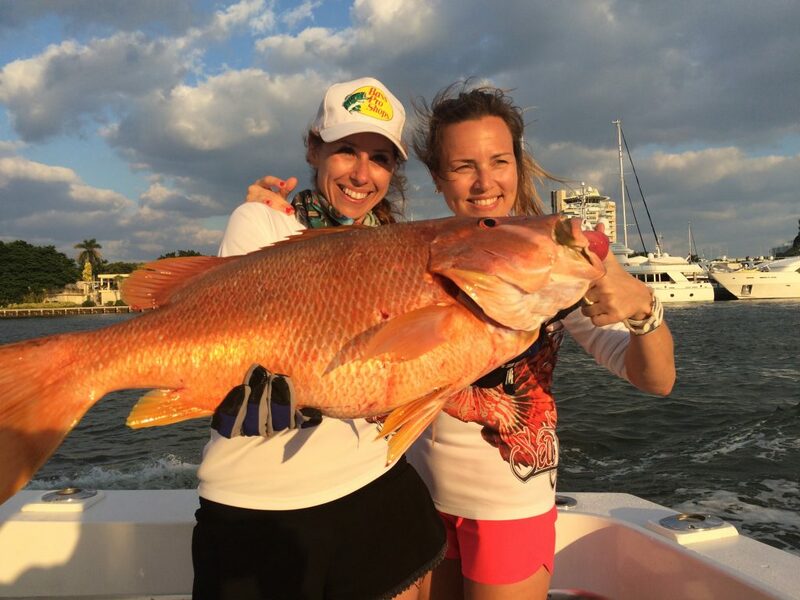 These snappers are very rare for us to catch in south Florida, especially one so large. Other strange and unusual bottom fish are biting too. We’ve caught some monster golden tilefish deep dropping in over 600ft of water. Barrelfish and oilfish are also biting. These are not usual catches for our fishing charters. Other big bottom dwellers such as warsaw grouper and some big amberjacks have been caught on our fishing charters this week. It’s been a great month for bottom fishing. Shark fishing is also starting to light up out there. 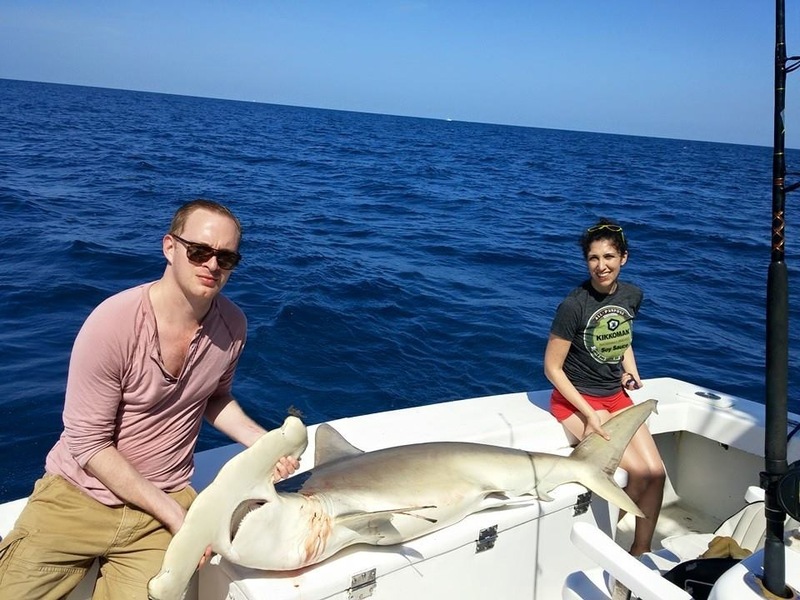 This week, we’ve caught several hammerhead sharks, a mako shark (very rare), a couple of sand bar sharks and a huge bull shark. I think this year will have some awesome shark fishing results. We’re still not fully into shark fishing season but the unusual fishing conditions had us floating out some big shark baits since the sharks were really riled up with the big moon and super tides. Glad we did because we caught some monster sharks over the past few days. The effects of the supermoon are still being seen with extraordinary tides, strange fish and unusual catches. As we normalize, look for great catches of mahi-mahi, sailfish, wahoo and cobia to be hitting the docks in the weeks to come. Good luck to everyone fishing out there this week. I’ll sea ya on the water. Nice wahoo just caught trolling the reef. Lots of wahoo being caught this week.